How to transfer Apps from your iPhone, iPod or iPad. Please note : Apps functionality is only available for iOS devices running iOS5 to iOS8. This functionality is not available for devices running iOS9 or iOS10. The functionality is not yet available in TouchCopy 16, only on TouchCopy12. With TouchCopy, you can view and copy Apps on your iOS device. Note that TouchCopy will only copy Apps on your iOS device that were purchased on the iTunes App Store. TouchCopy will not copy first party Apps installed by default on your device. (e.g. the Stocks and Calendar Apps). To view Apps on your iOS devices, select the "Apps" icon in the category list. To copy all your Apps back to iTunes, ensure no Apps are selected and then click "Copy To iTunes" in the Apps control bar or "Copy to iTunes" in the main TouchCopy control bar. To copy only a selection of Apps, select the Apps required from the list and then click "Copy to iTunes" in either the Apps or TouchCopy control bar. To copy all your Apps to your machine, ensure no Apps are selected and then click "Copy Application to PC/Mac" in the Apps control bar or "Copy to PC/Mac" in the main TouchCopy control bar. To copy only a selection of Apps, select the Apps required from the list and then click "Copy Application to PC/Mac" in either the Apps or TouchCopy control bar. Currently, this function is PC only. Each App in your iOS device has its own documents folder. Normally, this documents folder is visible only to the App itself. 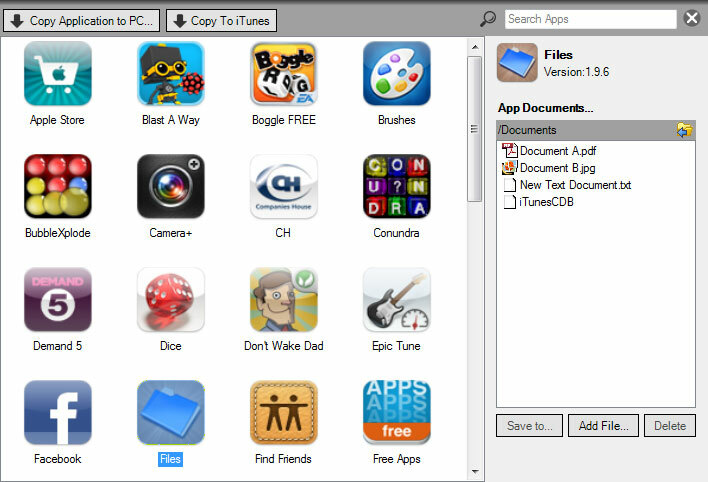 However, using TouchCopy, you can browse the contents of the Apps documents folder and copy, add or remove documents. Select one App from the list and ensure the Documents panel is visible by clicking the "Details/Documents" button. A list of documents and folders will be shown for the App you have selected. Double clicking a folder in this list shows documents in that folder. You can go back to the previous folder by clicking the Navigate Back button. Select a document from the list and click "Save to..." to save the file to your PC. Click "Delete" to permanently remove the document from your iOS device. You can also add files to the Apps documents area by clicking "Add File...". Depending on the functionality of the application you are adding files to, you may or may not be able to see the files you are adding. All of the Application files are available for this functionality.